Hawizeh Marsh Ramsar Site, a transboundary wetland, part of the Mesopotamian marshlands complex centered at the confluence of the Tigris and Euphrates rivers, the marshes are ca.75-80% located in Iraq with the remaining area extending into the Islamic Republic of Iran. The Mesopotamian Marshes are shared between Iraq and the I.R. Iran, and form one of the largest freshwater marshes in the world, being fed principally by the Tigris and Euphrates Rivers. On the Iraqi side lie the Central Marsh, Hammar Marsh and Hawizeh Marsh Ramsar Sites, with the latter extending into Iran where it is named the Haur Al-Azim. The Hawizeh Marsh was listed on the Montreux Record in 2010 due to threat of drying from the reduced rainfall and water input. The whole region is suffering from reduced rainfall and the construction of upstream water control structures and increasing water extraction for agriculture and other uses. As a result in mid-2017, the Government of Iraq requested the Ramsar Secretariat to organize a Ramsar Advisory Mission (RAM) to the marshes to identify ways for future cooperation between Iraq and Iran as a first step towards the long term conservation and sustainable development of the marshes, including ways to reduce the incidence of sand and dust storms. The RAM was organized from 16 to 23 December 2017. Seven officials from each Iraq and Iran, NGOs and members of the local community were present. There were also experts from UNEP, UNDP, ‎the UN Assistance Mission for Iraq, the Ramsar Regional Centre for Central and West Asia and from the Ramsar Secretariat. 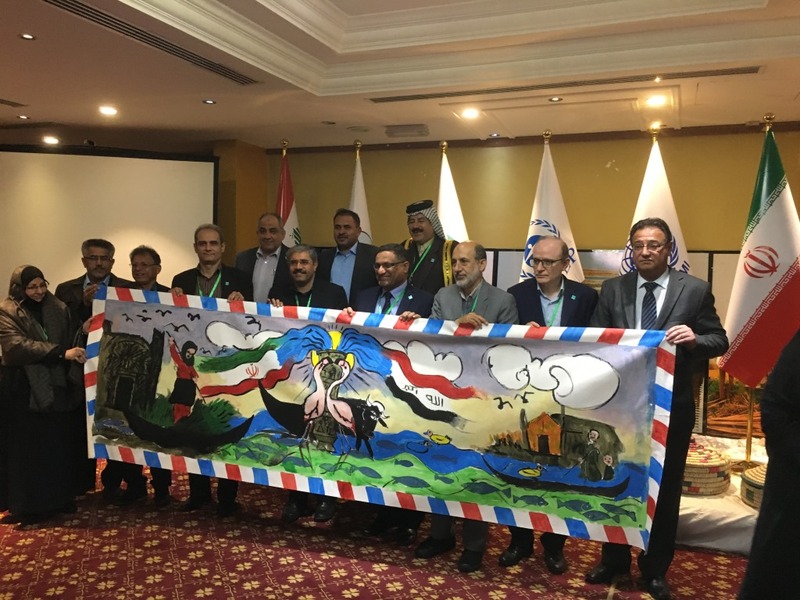 The RAM began in Iraq, with a workshop in Basra to introduce the importance of marshes and the issues it faces as seen from the Iraqi and Iranian sides. This was then followed by visits to the three Ramsar Sites as well as to meet the local communities who have returned to live in the marshes after the draining by the government of Saddam Hussein in the 1990’s and the reflooding that began after 2003. Next the RAM team crossed the border by road into Iran to visit the Haur Al-Azim which used to be connected with the Hawizeh Marsh in Iraq but the construction of a weir in the mid 2000’s along the international border has separated the two marshes. At the end of the RAM, a workshop was held in the Iranian city of Ahvaz to allow the sharing and discussion of what the participants had seen and heard during the visit and more importantly, to confirm areas of future cooperation. These areas included joint coordinated waterbird surveys in the marshes, to develop opportunities for exchanges of technical and scientific information on the ecology of the marshes, and joint celebration of international events such as World Wetland Day. The Ramsar Secretariat would like to thank for the support to all who participated in the RAM and for working together for the future of the marshes.